Casino Slot Machines! Nomad Gaming carries all major slot machine manufactures. Such as; WMS, Scientific Games, Bally, IGT, Aristocrat, Aruze, Ainsworth..
At Nomad Gaming, we have an extensive collection of pre-owned and refurbished slot machines for sale from all of the leading casino gaming manufacturers. Each and every machine is checked to ensure it’s in the finest working condition. And with a constantly rotating stock, you’re guaranteed to find the slot machine that matches your exact needs. Contact us today to speak with one of our sales representatives about availability and pricing or check out our ebay store. In the meantime, here are just some of the models and platforms you can order from us. Since the early 1980’s, IGT has set the industry standard for casino games and slot machine cabinets. Extreme durability and high performance are what set these machines apart from the rest. We are proud to supply you with products like the IGT G20, G22, AVP Trimline. From pinball to casino slot machines, WMS has been offering players compelling gaming experiences since 1943. With major technological innovations in quality and design, a WMS slot machine is sure to enhance your game room. We have a wide selection of BlueBird 1, BlueBird 2, BlueBird XD and BB3 upright and slant cabinets. As one of the first slot machine manufacturers, Bally Technologies (Bally’s) produces some of the leading video slot machines and reel-spinning slot machines on the market. Designed to be comfortable enough for you to play all day and all night long, a Bally’s machine will bring your game room to life. Aristocrat slot machines (also called bar machines) are extremely popular for their long-lasting, fully immersive gaming experience. Our Aristocrat offerings include Viridian, MK5 and MK6 – just to name a few. Atronic – bought by Spielo and now part of GTECH – built a reputation for some of the most beautifully designed casino slot machines. With some of the most popular game series out there including Doggy Cash, King Kong Cash, and Cash Fever, an Atronic/Spielo Emotion cabinet is sure to be one of your favorites too. 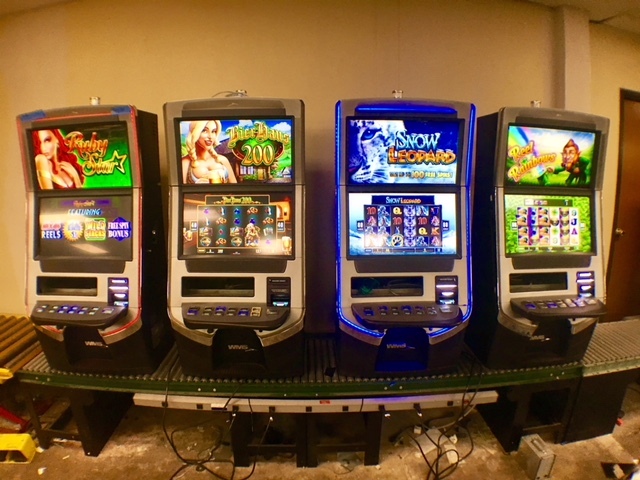 Best known for the famous Frogger arcade game, Konami has expanded their offerings over the years to include all types of slot machine cabinets and reel games. We provide all the most popular Konami slot machines. If you don’t see the slot machine brand you’re looking for, don’t worry. Contact us here and we will work hard to get you what you need. An eight-liner machine is a coin-operated electronic gaming machine that resembles a slot machine. Depending on the type of machine, a player “wins” if a horizontal, vertical, or diagonal row of objects line up. The machines now come in multiple variants and can include video reel, video keno and video bingo games, among many others. The cost to play a machine, as well as the prize for winning, varies.